I was inspired to make this after seeing a cinnamon roll pancake. I was going to try try to make the swirls like a cinnamon roll, but I decided to make it like a marble cake. I also initially decide to leave the cake and not invert it. 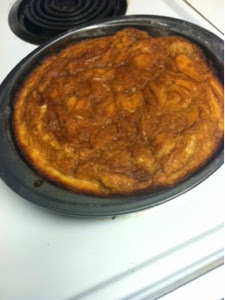 A while later I had change my mind and try to invert it out of the pan. 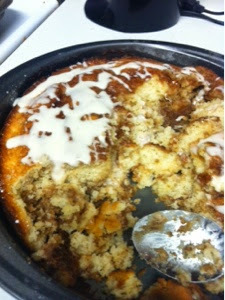 The cake just fell apart as I inverted the pan. For the sake of this recipe, we will leave it in the pan. This recipe will make make a 8 inch cake. Combine the dry ingredients, and the remaining ingredients. Beat with and electric mixer until blended then beat on medium speed for about a minute. Grease and flour 8 inch round (or square) pan. Add the cake batter. Dollop cinnamon filling on top of the cake. 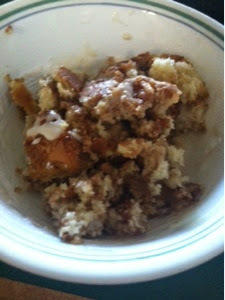 Use a knife to swirl the cinnamon filling through out the cake to make the marble effect. Bake in 350 degree oven for 25-30 minutes or until done. Cake will pull away from the sides and a toothpick will come out clean. You can add the glaze while the cake is still warm, I waited until it cooled a little. Oh my goodness! This looks like an easy to make, giant cinnamon roll! This is a great cake Julie! Thanks so much for sharing this awesome recipe with Full Plate Thursday. Hope you are having a great weekend and come back to see us real soon! This looks delicious and I like the falling apart part. Thanks so much for Wednesday's Adorned From Above Link Party.